I'm finally making my first experimental foray into using the "Dip." After much reading on the internets, I actually purchased these supplies almost a year ago. But I've just now got around to trying them. 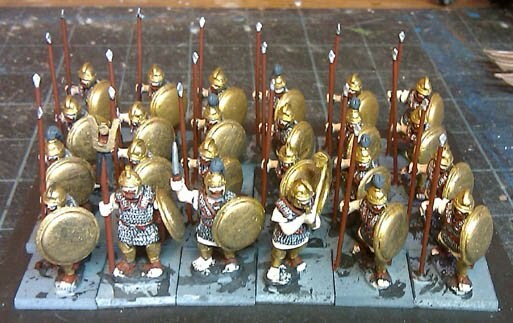 Here are my shiney shiney Carthaginians spearmen, basecoated. And here is a somewhat poorly lit shot after the "dip." I didn't actually dip the figures, but used the "apply heavy wash with brush" method. But that's a bit much to say or type quickly. So far the results look OK. Hard to say until they dry completely and I can hit them with a matte clearcoat. But so far I'm not sure the results are quite as good as I could get with a similar wash method using GW's Delvan Mud. 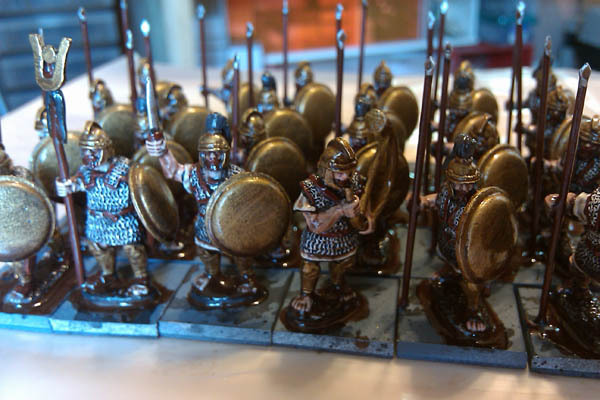 The trade off, of course, is that the large tin of Minwax costs less than two tiny bottles of Delvan Mud. And for what it's worth, I can skip the gloss coat and go straight to the matte. Not that I'm ready to give up on the Minwax yet. I've got a lot of the stuff and a bunch of figures that need painting. I will continue to experiment, and will post further photos as I finish these guys. This last photo shows why the above photo was poorly lit. I've got my "dipping station" set up on a separate table, so I can let it sit & dry overnight while not getting in the way of my regular painting spaces. 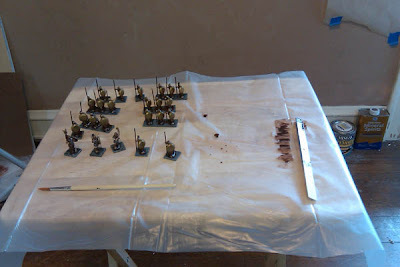 I use a craft paint color called "dark burnt umber",a blackish brown,the same color that I undercoat with. That is mixed with the Future and water. I gave up on the Minwax years ago,its too hard to work with,you cant thin it,and with the Future,you can switch colors if desired. What a friend of mine does is makes up the wash of future and distilled water ready made in a bottle and adds desired amount to paint. I've got two re-purposed paint bottles. One with straight Future, one with a Future + water mix. But I also like the ease of having something pre-mixed. A "dip" type wash that's all ready to go for speedy painting. I've tried making my own replacement for GW's "Badab Black" as well, but with only mixed results. It's the flow & coverage that I'm trying to match as much as the color. 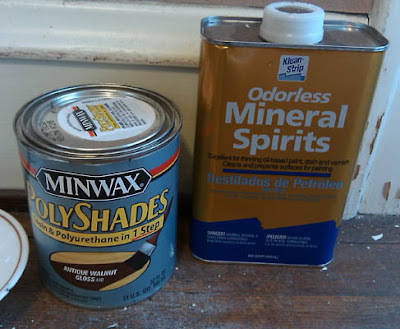 I have to make a stop at the craft store for a replacement bottle of slate grey paint. I'll look for dark umber and others. looking foreward to seeing the results when things are dried out. The dip always seems as if it would work best for simple colors, such as skeletons. It's certainly very effective and most probably a lot cheaper than other dips! If you want to try the dark burnt umber,its a Ceramcoat color,and I know that Michael's carries it,but otherwise its kind of hard to find. My buddy picks it up for me when they have sales. I got a bottle of the Ceramcoat dark burnt umber ($0.79!) and it is perfect for mixing a replacement for Delvan Mud! I made an initial mix, it was a bit light on the pigment, so I added a bit more paint and it turned out pretty well. My mix is still a little glossy (need to try adding more anti-shine stuff) and I'm thinking about either reducing the water or cutting it out altogether. If this works out as well as it seem so far, I may mix up a large batch and give up on the Minwax unless it offers something better in my second experiment. I have put my first small batch in a bottle and labeled it "substance D" as in "D"elvan. And because I am a PKD fan and A Scanner Darkly is one of my favorite books. I've been using db umber for years as my undercoat. Dark enough to do the job,but not so harsh as black,and much easier to cover.